Apple CEO Tim Cook says that the company will continue to bridge the gap between iOS and Mac OS X by integrating more popular features from the mobile operating system. 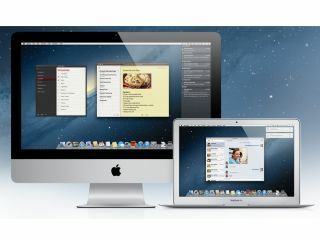 Wednesday's launch of Mac OS X 10.8 Mountain Lion, which will arrive this summer, brings more functionality from iOS, including AirPlay Mirroring, a new Messaging app and notifications. Cook told the Wall Street Journal that Apple will keep converging the two operating systems in future versions to give users the features they love from the iPhone and iPad ecosystem. He said: "We see that people are in love with a lot of apps and functionality [on the iPhone]. Anywhere where that makes sense, we are going to move that over to Mac." All roads lead to a touchscreen Mac? The feeling among many industry observers is that the two operating systems will eventually meet as one if Apple decides to launch a touchscreen MacBook or iMac computer. Cook also refused to rule out that future Mac devices will run off the same chipset as mobile devices like the iPad and iPhone. While Cook told the WSJ that the tablet and laptop markets will continue to exist as separate entities, he added: "We think about everything. We don't close things off." Check out our Mac OS X Mountain Lion: What you need to know rundown to discover the 100+ new features coming in summer 2012.